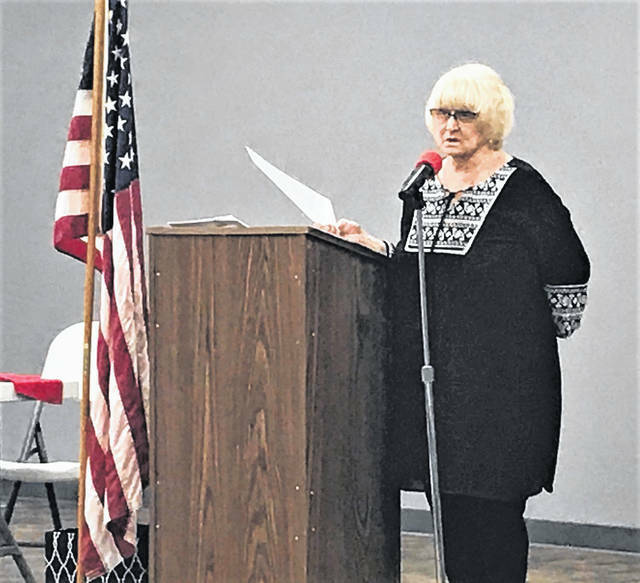 One of the organizers of the event, a former plant worker and self-proclaimed whistle-blower, local resident Vinna Colley talked about employees at the Portsmouth Gaseous Diffusion Plant in Piketon, a.k.a. the Portsmouth A plant, working their jobs in street clothes, then going home in those street clothes, clothing that in her opinion was contaminated with radiation and possibly other poisons. The implication was, of course, that contamination was then spread through those employee’s homes and possibly to people with whom they came in contact. One speaker claimed she was a recipient of some of that contamination, as her father was a longtime worker at the plant when it was operational and producing weapons grade radioactive materials. The woman alleges as an adult, doctors found traces of radiation in her hair. “In my opinion, people will die out there,” Lawson said. The above comments represent only a small percentage of the criticism and outright anger aimed at DOE regarding its oversight of the Piketon plant both during its operating days and now during what officials term the demolition and decontamination of the plant site. The occasion for all that criticism was a press conference/forum held Tuesday evening before a small crowd of about 20 people gathered in the Scioto County Welcome Center. The event was sponsored primarily by local activists Portsmouth/Piketon Residents for Environmental Safety and Security (PRESS,) which is headed by Colley. Additional named sponsors included, among others, National Nuclear Workers for Justice (NNWJ) and A Call to Actions. For those who have been following the story around the defunct uranium enrichment plant and the ongoing demolition of that plant, many of the evening’s topics of discussion might sound somewhat familiar. Colley and PRESS have been unrelenting critics of DOE activities as they work to demolish the shuttered Piketon facility. Colley has had especially harsh words for DOE’s plans to place a permanent waste disposal facility on plant property, a facility which would hold demolition materials from the mammoth plant and which critics commonly refer to as a radioactive waste dump. Colley, who alleges she became sick while working at the plant, also is highly critical of the government’s attempts to compensate workers who also claim they became ill at such plants across the country. “New evidence uncovered shows that the entire plant was and is contaminated with transuranics and fission products including, plutonium, neptunium, americium, radium, protactinium, technetium, etc. All of these elements are unstable and decay radioactively into other elements. “With this new evidence, workers’ cases should be reopened so the sick workers do not have to keep jumping through loopholes. As previously noted, much of the criticism presented Tuesday has been presented previously. Colley and other critics repeated their claims the waste disposal facility is being constructed on fractured bedrock, which could allow any liquid leakage from the disposal site to reach groundwater, a claim DOE repeatedly has dismissed. DOE scientists as well as those of Fluor BWXT, the private contractor handling demolition of the plant, deny the bedrock is fractured and also point to a liner that will sit at the bottom of the disposal facility and which DOE officials claim will last a thousand years. For his part, one Tuesday night speaker isn’t buying that argument. He claimed animals chewed through a similar liner at a different site. The “new evidence” referred to in the event press release apparently consists of two studies of the plant done many years ago, while it was still operating. Both reports contend the plant contains (or did so at the time of the reports) high levels of various types of radioactive materials. Colley and others have repeated claims DOE is not being honest about the levels of radiation present around the plant. Another claim made Tuesday, is DOE is relying on semantics when it says no material except that coming directly from the Piketon plant will be placed in the permanent waste disposal facility. One speaker stated plutonium at the plant came from places as far away as Russia. Another talked about how an entire plant similar to the Piketon plant was shipped in by train and buried at the Portsmouth facility. DOE and Fluor-BWXT officials did not deny the burial of such a plant when confronted about the issue by the Daily Times. But again, critics say officials are lying about the level of radioactivity present. Cantrell and other DOE officials repeatedly have stated reopening the record of decision approved by the Environmental Protection Agency regarding the waste cell is the only way to block the project at this point. But they also add reopening of the ROD is highly unlikely if not legally impossible.